Several major assumptions drawn from biblical study and theological reflection undergird Christian family ministries. 1. God is a relational being who has made human beings for relationships (Gen. 1:26-28; 2:18; Eph. 1:4-6; Rev. 4:11). God often reveals Himself to us in family terms. From Him we learn of marriage (Is. 54:5) and the parent-child relationship (Deut. 1:31; John 20:17). 2. The family was instituted by the Creator as His primary setting for human development and nurturance (Gen. 2:18-25; Ps. 68:5, 6). 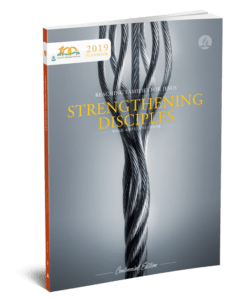 Since family is the primary place where the capacity for love and intimacy with God and other human beings is developed and where spiritual values are transmitted across generations, it is central to the disciple making process. 3. The image of God is expressed in human beings as male and female. The Creator’s act of bringing the two together as equals in a monogamous, heterosexual union established the pattern for marriage. This union provides for companionship, fulfillment and the perpetuation of the human family (Gen. 1:26-28; 2:18, 21-25). The relationship of the sexes in marriage has been distorted by sin (Gen. 3:16), but redeemed by Christ (Matt. 20:26, 27; Eph. 5:21-31). Christ makes a difference in the marriage of Christians. A mutuality prevails that restores the Edenic ideal. Husbands and wives are “heirs together of the grace of life” (1 Peter 3:7). 4. Despite the high biblical ideals for marriage and the divine power that is available to enable marital commitment to endure, some individuals will not survive in marriage. Some will commit adultery in taking another partner (Mark 10:11, 12). Despite the heartbreak, loss, disruption and long term consequences of divorce, within the context of redemption divorce and marriage to another that may follow are not viewed as unpardonable sins beyond which there is no spiritual life and fellowship. Through repentance, confession, and the appropriate bearing of responsibility, grace can bring assurance of pardon, healing and new beginnings (1 John 1:9; 2:1). 5. While marriage is God’s general plan, singleness is within the divine design as well. It may be in the best interest of certain individual Christians to live singly (1 Cor. 7:7). God’s special acceptance and protection are over those who by choice or circumstances face life alone (Ps. 68:5, 6; Jas. 1:27). Friendship is a source of intimacy and of experiencing family. The fellowship of the Church, the household of God, is available to all regardless of their married state (1 John 1:3). 6. Sexual intimacy is reserved for marriage (1 Cor. 7:2-6). Expression outside of marriage is contrary to the divine purpose (Gen. 2:24; Prov. 5:1-18; 1 Cor. 6:15, 16). Sexuality serves a unitive function in marriage which is distinguishable from the procreative function. Joy, pleasure and delight are intended for married sexuality (Ecc. 9:9; Prov. 5:18, 19; Song of Songs 4:16-5:1). God intends that couples have on-going sexual communion apart from that utilized for procreation (1 Cor. 7:3-5). This strengthens and protects marriage from inappropriate bonding with one other than one’s spouse (Prov. 5:15-20; Song of Songs 8:6, 7). 7. Bearing children is an option through which couples who are able and choose to do so participate in the blessing God intended children to be (Ps. 127:3-5). While marriages generally yield offspring (Gen. 1:28), procreation is not viewed as an obligation incumbent upon every couple in order to please God. God values children (Matt. 19:14). Children help parents understand about loving and trusting God (Ps. 103:13). They encourage the development of sympathy, caring, humility, and unselfishness in families (Ps. 127:3-5; Lk. 11:13). Parents are to provide, teach, and correct their children so they may come to know God, choose biblical values and be prepared for responsible interdependence with others (Deut. 6:6-25; Prov. 22:6). 8. God’s covenant love with His people is the basic principle of family life. In God’s covenant we experience love, forgiveness, commitment, acceptance, intimacy, and even sacrifice, that our deepest needs might be met. As we reflect the gospel in our families, our relationships with each other are fashioned after the likeness of the divine relationship with humanity. Christian family members are called to love, to serve one another, and to forgive just as He loves, serves and forgives us. Strength and grace from God are promised to accomplish that to which God calls us (Jer. 31:31-34; Matt. 20:26-28; Eph. 4:32; Heb. 8:10-12; 1 John 3:16). 9. Broken relationships with God and with fellow humans were the tragic outcome of the Fall (Is. 59:2). Jesus’ mission restored agape-love relationships (Matt. 22:37-40; John 13:35; 15:12). His Church is an ongoing extension of His work in restoring broken relationships. The Church will incorporate into its evangelistic mission the sound of God’s healing voice in the midst of human tragedy and brokenness (John 10:10; 20:21; Gal. 6:2; James 5:15).